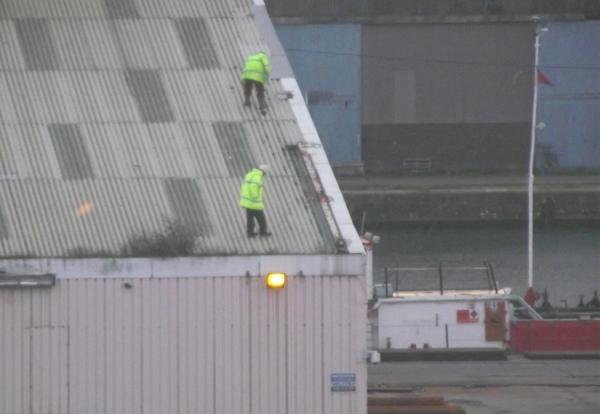 A Merseyside contractor landed in court after a worried passer-by took photos of workers risking their lives on a warehouse roof in Birkenhead. Three men were seen repairing the leaking roof 16 metres above the ground without harnesses or any suitable safety measures to stop them falling. Their employer, Davidson Williams (Merseyside) Ltd, was prosecuted after a concerned member of the public sent photos to the Health and Safety Executive (HSE). Wirral Magistrates’ Court heard that HSE found there were around 400 clear plastic panels on the roof, designed to let in light, which could have broken away if they had been stepped on. Two of the men were initially seen walking along the sloping warehouse roof at Vittoria Dock on 24 November 2011 to check it for leaks, before all three went onto the roof to carry out the repairs. The court heard the workers wore hard hats and high-visibility jackets, but that neither of those items would have saved their lives if they had fallen through one of the fragile panels or off the edge of the roof. Davidson Williams (Merseyside) Ltd pleaded guilty to breaching safety regulations and was fined £3,500 with £1,500 costs. Speaking after the hearing, HSE Inspector Christina Goddard said: “There were several ways this work could have been carried out safely, including using harnesses, installing netting under the fragile panels, or erecting scaffolding. But none of these methods was chosen by the company. “Instead, the three employees were left to repair the leaking roof without any protection to stop them being injured in fall off the edge or through one of the hundreds of clear plastic panels.